Background :: Ed'son de Pary E.A. The name of the country derives from the term used for the Wouri River by Portuguese explorers. Reaching the Cameroon coast near the modern port city of Douala around 1472, those explorers named the river Rio dos Camaroes ("River of Prawns") after the variety of crayfish they found there. This name later was applied to the coastal area between Mount Cameroon and Rio Muni. Cameroon has distinct regional cultural, religious, and political traditions as well as ethnic variety. The division of the country into British- and French-ruled League of Nations mandates after World War I created Anglophone and Francophone regions. The English-speaking region consists of the Southwest and Northwest provinces, where Pidgin English (Wes Cos) is the lingua franca and English is taught in school. The educational system and legal practices derive from those of England. The French-speaking region consists of the remaining eight provinces, where French is the lingua franca, the French school system is used, and the legal system is based on the statutory law of continental Europe. This region is dominant in numbers and power. Tension between the two regions increased after the introduction of a multiparty political system in the 1990s. The English-speaking region is divided into two cultural regions. The Grassfields peoples of the Northwest Province consist of nearly one hundred chiefdoms each ruled by a divine king (fon). Most of these chiefdoms have patrilineal or dual descent kinship systems, although some groups, such as the Kom, are matrilineal. Polygyny and fertility are important cultural values, although this varies by wealth and education. The social organization and culture of the Grassfielders are closely related to those of the French-speaking Bamiléké peoples of the Western province. Like the Bamiléké, Grassfielders often are in opposition to the central government. The peoples of the Southwest province had less hierarchical systems of governance and social organization. The British appointed warrant chiefs to aid their colonial rule, and in many instances the population rallied behind those chiefs in the postcolonial period. The peoples of the Southwest province include the Bakweri, who live along the slopes of Mount Cameroon. The Bakweri practice rites of healing and initiation in associations of spirit mediums that distinguish between male and female roles and between village and bush. In the French-speaking area, the largely Muslim north is culturally distinct from the largely Christian and animist south. The northern area includes three provinces: Adamoua, North, and Extreme North. Since the jihad led by an Islamic cleric in 1804, the northern region has been culturally dominated by the Fulani. Urban Fulani are renowned as clerics in the Sunni branch of Islam. Most Fulani are cattle herders. An important subgroup are the Bororo'en, noted for the size of their cattle herds. With their Hausa colleagues, they engage in long-distance trade involving cattle. Other northern ethnic groups include the Mandara, Kokoto, and Arab Choa. Major crops include cotton and millet. which reciprocity is a key value. Forestry and tobacco farming are important sources of income. The East province is also home to the Baka, a tropical forest forager (pygmy) group of about thirty thousand to forty thousand living in small camps that exchange forest products with nearby farmers. The Littoral province is in the coastal rain forest region in the southwest. It includes the largest city, the port of Douala, and the industrial, hydroelectric, and bauxite mining area near Edea. The major ethnic groups are the Duala and Bassa. The southern part of the French-speaking area includes the high plateau region of the West province, which includes the Bamiléké and Bamoun peoples. Both are culturally similar to the Grassfielders. The Bamiléké constitute roughly 25 percent of the population. In rich volcanic soils they grow food crops and coffee. The population is dense, and the Bamiléké served as a labor reserve population in the twentieth century, resulting in large, entrepreneurial urban émigré population. The large urban population is prominent in commerce and higher education. Since the conversion of Sultan Njoya to Islam early in the twentieth century, the Bamoun have been a largely Muslim people. Sultan Njoya, a man of unusual intellect, developed an original alphabet and wrote a history of his people and dynasty. A sense of a common national culture has been created through shared history, schooling, national holidays and symbols, and enthusiasm for soccer. However, ethnic distinctiveness remains, and ethnic identity became an increasingly important source of social capital during the 1990s. Cameroon is situated by the Gulf of Guinea on the west coast of Africa. Its area is 179,527 square miles (465,000 square kilometers). 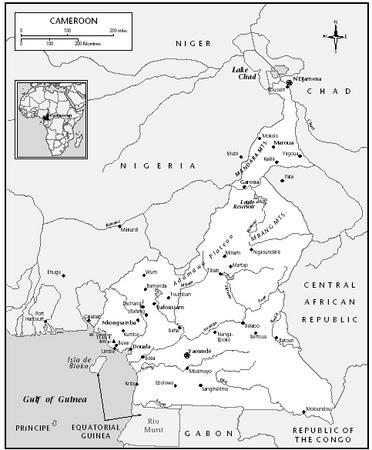 Nigeria lies to the west, Chad and the Central African Republic to the east, and the People's Republic of Congo, Equatorial Guinea, and Gabon to the south. The climate is hot and humid in the forested south and west, cooler in the highland Grassfields region of the West and Northwest provinces, and hotter and drier in the savanna and sahel of the north. The capital, Yaoundé, is in the Center province. It has experienced rapid growth and increasing strife between immigrant groups (particularly the Bamiléké) and the native Beti.